NinjaPuppy wrote: Who is discrediting Randi? Seems to me that might be scepcop's intent. There's a presedence for it though I can't be sure. And they want you to come to The Amaz!ng Meeting 8. Though online registration is now closed, you can still register on site for the biggest, baddest, and most exciting skeptics conference ever. Just added: Gary Stockdale and the Peepshow Trio will be entertaining us on Thursday evening. Also, Adam Savage will be bringing three very special items that you'll have a chance to take home with you, and Jerry Andrus's illusions will once again grace the halls of TAM. This is the year for TAM. Don't miss out. Be sure to register at the door at the South Point Hotel and Casino on July 8, 2010. We'll be waiting. I so appreciate the effort to organize events for "like minded" folks... especially a Revival Meeting & Pep Rally of this sort. So, is Randi going to walk on water this year? Its amusing to see Brownings obsession with Randi,yet he never seems to post on JREF forum -if indeed he is a member(I doubt) its cowardly tactics IMO. Still waiting for proof of Yellow bamboo being denied a shot at the final challenge after passing preliminary as is his claim. Craig there are no psychics get over it. Randi doesnt care about you either,get over that too. Do woo believers think destroying Randi will make scepticism go away? Azrael wrote: Its amusing to see Brownings obsession with Randi,yet he never seems to post on JREF forum -if indeed he is a member(I doubt) its cowardly tactics IMO. Still waiting for proof of Yellow bamboo being denied a shot at the final challenge after passing preliminary as is his claim. Who exactly is "destroying Randi" here? We are discussing a poorly edited video clip from The Charles Grodin Show for cryin' out loud. On any of the forums like this any time Randi is brought up it never seems to me Randi has ever received praise. I could be wrong and this topic was actually posted to praise Randi for his good works, but I have great doubts that it was. really? wrote: On any of the forums like this any time Randi is brought up it never seems to me Randi has ever received praise. I could be wrong and this topic was actually posted to praise Randi for his good works, but I have great doubts that it was. Friends, Romans, countrymen lend me your ears......I've come to bury Ceasar, not to praise him. Sorry. Praising skeptics is not in my job description. NinjaPuppy wrote: Friends, Romans, countrymen lend me your ears......I've come to bury Ceasar, not to praise him. How would you like to be turned into a newt? I would welcome any spell you care to cast on me Ninja...Who knows, I may like it! Back on topic please. Did you ever get a chance to watch this video? Did ya? Huh? Huh? NinjaPuppy wrote: Back on topic please. Did you ever get a chance to watch this video? Did ya? Huh? Huh? Unlike what some people here claim, I'm really not into the guy at all and couldn't care less about his past, present, or future. Kinda like Catholics. Just because there's a priest who has done dispicable things doesn't mean you can't believe in the same religion. Ohhhh, go ahead... watch it. You know you want to. NinjaPuppy wrote: Ohhhh, go ahead... watch it. You know you want to. Truthfully I was going to watch it this morning, but now that I've been turned into a newt, my finger isn't strong enough to punch down the mouse button. BWAH! 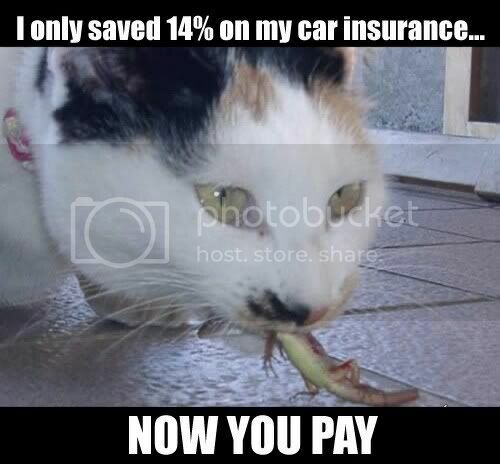 If the Geico gecko can do it, so can YOU!